Pain and tenderness are common symptoms. If the affected joint is close to the skin, as with the shoulder, knee, elbow, or Achilles tendon, swelling and redness are seen and the area may feel warm to the touch. The bursae around the hip joint are deeper, and swelling is not obvious. Movement may be limited and is painful. In the shoulder, it may be difficult to raise the arm out from the side of the body. Putting on a jacket or combing the hair becomes a troublesome activity. In acute bursitis symptoms appear suddenly; with chronic bursitis, pain, tenderness, and limited movement reappear after exercise or strain. Conservative treatment of bursitis is usually effective. The application of heat, rest, and immobilization of the affected joint area is the first step. A sling can be used for a shoulder injury; a cane is helpful for hip problems. The patient can take nonsteroidal anti-inflammatory drugs (NSAIDs) like aspirin, ibuprofin, and naproxen. They can be obtained without a prescription and relieve the pain and inflammation. Once the pain decreases, exercises of the affected area can begin. If the nearby muscles have become weak because of the disease or prolonged immobility, then exercises to build strength and improve movement are best. A doctor or physical therapist can prescribe an effective regimen. If the bursitis is related to an inflammatory condition like arthritis or gout, then management of that disease is needed to control the bursitis. When bursitis does not respond to conservative treatment, an injection into the joint of a long-acting corticosteroid preparation, like prednisone, can bring immediate and lasting relief. A corticosteroid is a hormonal substance that is the most effective drug for reducing inflammation. The drug is mixed with a local anesthetic and works on the joint within five minutes. Usually one injection is all that is needed. Surgery to remove the damaged bursa may be performed in extreme cases. If the bursitis is caused by an infection, then additional treatment is needed. Septic bursitis is caused by the presence of a pus-forming organism, usually staphylococcus aureus. This is confirmed by examining a sample of the fluid in the bursa and requires treatment with antibiotics taken by mouth, injected into a muscle or into a vein (intravenously). The bursa will also need to be drained by needle two or three times over the first week of treatment. When a patient has such a serious infection, there may be underlying causes. There could be undiscovered diabetes, or an inefficient immune system caused by human immunodeficiency virus infection (HIV). Arthritis — Inflammation of a joint that may lead to changes in the joint's structure. It causes pain and swelling. Rheumatoid arthritis is a chronic disease that leads to crippling deformities. Diabetes mellitus — A metabolic disease caused by a deficiency of insulin, which is essential to process carbohydrates in the body. Gout — A hereditary metabolic disease that is a form of arthritis and causes inflammation of the joints. It is more common in men. Inflammation — The reaction of tissue to injury. Kinesiology — The science or study of movement. Alternative treatments take into consideration the role of diet in causing bursitis. The faulty use of calcium by the body, magnesium deficiency, and food allergies may have a role. Diet changes and vitamin supplements may be helpful. The use of herbs, homeopathy, aromatherapy, and hydrotherapy can help relieve symptoms. Ginger is useful in reducing inflammation. Acupuncture has been proven effective in treating hip and shoulder pain caused by bursitis and other conditions. Other therapies that deal effectively with musculoskeletal problems (relating to the muscles and skeleton), may also be helpful, such as body work, magnetic field therapy, naturopathic medicine, chiropractic, and applied kinesiology. Bursitis usually responds well to treatment, but it may develop into a chronic condition if the underlying cause is not corrected. Aggravating factors should be eliminated to prevent bursitis. Overexercising or the repetition of a movement that triggers the condition should be avoided. Doing exercises to strengthen the muscles around the joint will also help. When doing repetitive tasks, frequent breaks should be taken and the activity should be alternated with others using different parts of the body. To cushion the joints, it is a good idea to use cushioned chairs when sitting and foam kneeling pads for the knees. Leaning on the elbows, kneeling or sitting on a hard surface for a long period of time should be avoided. Not wearing high heels can help prevent bursitis in the heel, as can changing to new running shoes as soon as the old ones are worn out. inflammation of a bursa; types are usually named for the bursa involved. The subdeltoid bursa in the shoulder is most commonly affected, but inflammation may develop in almost any bursa in the body. Excessive use of the joint is often the cause. Acute bursitis comes on suddenly; severe pain and limitation of motion of the affected joint are the principal symptoms. Resting the joint, moist heat, and the use of analgesics or nonsteroidal antiinflammatory drugs frequently are sufficient treatment. Chronic bursitis may follow the acute attacks. There is continued pain and limitation of motion around the joint. X-ray examination will usually reveal the deposit of calcium salts. If rest, heat, and medications do not relieve the condition, surgery may be required to remove the calcium deposits or free the area of chronic inflammation. /bur·si·tis/ (bur-si´tis) inflammation of a bursa; specific types of bursitis are named according to the bursa affected, e.g., prepatellar bursitis, subacromial bursitis, etc. calcific bursitis see under tendinitis. ischiogluteal bursitis inflammation of the bursa over the ischial tuberosity, characterized by sudden onset of excruciating pain over the center of the buttock and down the back of the leg. subacromial bursitis , subdeltoid bursitis see calcific tendinitis, under tendinitis. Tornwaldt's bursitis chronic inflammation of the pharyngeal bursa. Inflammation of a bursa, especially in the shoulder, elbow, or knee joint. inflammation of the bursa, the connective tissue structure surrounding a joint. Bursitis may be precipitated by arthritis, infection, injury, or excessive or traumatic exercise or effort. The chief symptom is severe pain of the affected joint, particularly on movement. Treatment goals include the control of pain and the maintenance of joint motion. Acute pain is often treated with an intrabursal injection of an adrenocorticosteroid. Other common treatments are analgesics, antiinflammatory agents, cold, and immobilization of the inflamed site. After the inflammation has subsided, heat may be helpful. In chronic cases, surgery may be required to remove calcium deposits. Kinds of bursitis include housemaid's knee, miner's elbow, and weaver's bottom. See also rheumatism. Inflammation of a bursa, which may be accompanied by calcification of the supraspinatus tendon or of the subdeltoid bursa. Inflammation, pain, limited movement, decreased ROM. Idiopathic, chronic overuse, trauma, rheumatoid arthritis, gout, infection. Shoulder, knee, elbow, Achilles tendon, first metatarsal of the foot (bunion), etc. Inflammation of a bursa, which may be accompanied by calcification of the supraspinatus tendon, or of the subdeltoid bursa Clinical Inflammation, pain, limited movement, ↓ ROM Etiology Idiopathic, chronic overuse, trauma, rheumatoid arthritis, gout, infection Sites Shoulder, knee, elbow, Achilles tendon, first metatarsal of the foot–bunion, etc Management–non-infectious Rest, ice, NSAIDs, analgesics Infectious Antibiotics, aspiration, surgery. See Anserine bursitis, Aseptic bursitis, Calcific bursitis, Knee bursitis, Septic bursitis, Shoulder bursitis. Inflammation of a bursa that is most often caused by overuse or repeated stress to a joint. Symptoms include swelling, pain, and decreased range of motion. Inflammation of a bursa, esp. between bony prominences and muscle or tendon, as in the shoulder and knee. It is typically caused by repeated stresses placed on a joint during work or play, but sometimes results from sudden trauma, from inflammatory joint disease, or bacteria. Common forms include rotator cuff, miner's or tennis elbow, and prepatellar bursitis. Fluid accumulation in the bursa results in irritation, inflammation, sudden or gradual pain, and symptoms such as impaired joint movement. Inflammation of the sartorius bursa located over the medial side of the tibia just below the knee. Bursitis caused by bacterial invasion of the joint. Inflammation of a BURSA. Bursitis is commonly due to excess local pressure or undue friction, but it may also result from rheumatic disease or infection. Common examples are HOUSEMAID'S KNEE, TENNIS ELBOW and BUNION. inflammation, with swelling, of a bursa. 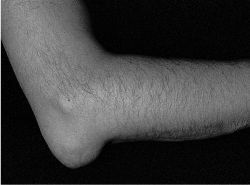 olecranon bursitis of the bursa over the point of the elbow; prepatellar bursitis ( syn housemaid's knee) of the bursa in front of the patella, frequently associated with excessive kneeling; retrocalcaneal bursitis of the bursa at the back of the heel between the calcaneum and the Achilles tendon near to its insertion, causing a swelling at both sides of the tendon. See also knee joint, trochanteric bursitis. n painful condition in which the connective tissue, or bursa, that surrounds the joints becomes inflamed, often chronically. inflammation of a bursa. Acute bursitis comes on suddenly; severe pain and limitation of motion of the affected joint are the principal signs. See also hygroma, intra-abdominal abscess. Chronic bursitis may follow the acute attacks. There is continued pain and limitation of motion around the joint. inflammation, in the horse, of the bursa between the tendon of the middle gluteal muscle and the major trochanter of the femur or its cartilage. 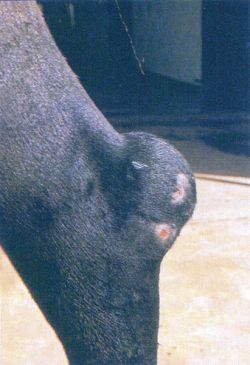 Causes lameness and atrophy of muscles in long-standing cases. Called also whirlbone lameness. Traumatic bursitis (capped hock) in horse. By permission from Knottenbelt DC, Pascoe RR, Diseases and Disorders of the Horse, Saunders, 2003. Bursitis symptoms include pain that starts on the outside of your shoulder and gradually spreads down your arm. Study sample included all cases of bursitis diagnosed during the period 2009 to 2015. 7 Usually the pain is the direct cause of the scapulothoracic bursitis located at the level of the levator scapulae muscle insertion at the superomedial angle of the scapula. While non-septic bursitis (NSB) has been widely observed among athletes, to our knowledge only one case of SB resulting from sport participation has been reported in the literature. Based on history and clinical examinations, the case was diagnosed as temporal bursitis and surgical bursectomy was planned to correct the condition. Combined vascular events and bilateral olecranon bursitis simultaneously during IFN therapy have not been reported in the past. Less commonly, bursitis is caused by an infection, gout and rheumatoid arthritis. The differential diagnoses of tubercular trochanteric bursitis include septic bursitis, chronic pyogenic osteomyelitis, post-traumatic bursitis, postural bursitis, idiopathic trochanteric bursitis and neoplasia (4,8). 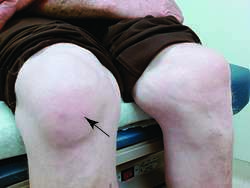 Although trochanteric bursitis is regarded as a clinical diagnosis, several investigators have reported a limited role for imaging in confirming the diagnosis. Exercises for shoulder bursitis and shoulder impingement relief. Additionally, patients with PMR were more likely to have abnormal ultrasound findings in their shoulders (especially subdeltoid bursitis and biceps tenosynovitis), and hips (synovitis and/or trochanteric bursitis). Is it statin induced polymyalgia rheumatica or just a coincidence? Clinician should thereby understand the anatomy, etiology, clinical features, differential diagnosis for the management of Hamular Bursitis.